This is a quick tutorial to help you move all your assets to a Jaxx Wallet. The same concept can be used to move your funds to any other HD wallet that supports a 'seed phrase' restore process. Users should be aware that the Jaxx wallet is unaffiliated with Exodus. We cannot speak or vouch for their security practices. First, be sure you have your Exodus 12-word phrase. 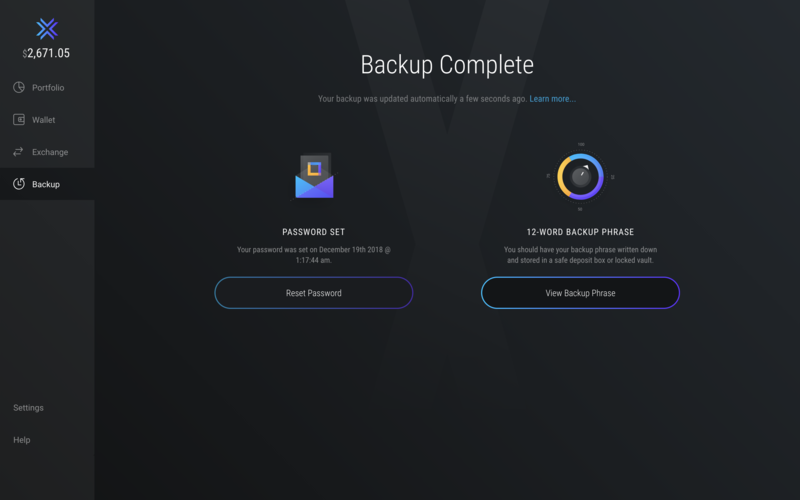 If you don't have this, click on the 'Backup' section and then on the 'View Backup Phrase' button. Check if all your assets were restored successfully and follow the steps below to delete your Exodus wallet from your computer. Do not delete your Exodus wallet folder until you have confirmed that all your balances show correctly on Jaxx. Finally, you have to uninstall Exodus from your system and remove the following folder containing your digital asset keys and wallet data on your computer. The process and data directory are different depending on if you are on a PC, Mac or Linux. ** Windows users may need to show hidden files to access this folder. Linux users may need to show hidden files to access this folder. On most Linux platforms you can turn on hidden files by typing Control + h.
How do I create multiple accounts or users?